Elected in 2002 as the first woman Senator from North Carolina, Elizabeth Dole developed an impressive public service career long before reaching the U.S. Senate. Her role as a Cabinet officer for two Presidents, her own bid for the Republican nomination for President in 2000, and her campaign work for her husband, former Senator Bob Dole, gave Senator Elizabeth Dole a deep reserve of political experience to bring to her term in the Senate. Mary Elizabeth Hanford was born on July 29, 1936, in Salisbury, North Carolina, to John Van Hanford, a flower wholesaler, and Mary Ella Cathey Hanford. In 1958, Hanford earned a B.A. from Duke University in political science. In the summer of 1959, she studied British history at Oxford University. Hanford subsequently moved to Boston and earned an M.A. from Harvard University in education and government in 1960. She completed a Harvard law degree in 1965, one of only 24 women in a class of 550. After graduation, Elizabeth Hanford was drawn to the nation’s capital, claiming “Washington was like a magnet.”1 In more than 30 years in the capital, she accumulated a formidable political résumé. Her first involvement in national politics was serving as the White House consumer affairs aide for President Richard Nixon. While serving as a consumer advocate for the Federal Trade Commission, Elizabeth Hanford met Kansas Senator Bob Dole, whom she married in 1975.2 In 1981, President Ronald W. Reagan named her an assistant for the public liaison. From 1983 to 1987, Dole was the first woman to serve as Transportation Secretary.3 Increased safety was her priority, promoting measures such as a third rear–brake light and airbags in all vehicles, as well as raising the drinking age to 21 years. In 1989, President George H.W. Bush named Dole as his Labor Secretary. When longtime incumbent North Carolina Senator Jesse Helms announced his retirement in 2002, Elizabeth Dole decided to seek his seat in the U.S. Senate. Dole easily won the GOP primary, taking 80 percent of the vote against six opponents. She faced Democratic nominee Erskine Bowles in a hard–fought general election. She ran on a platform dubbed the “Dole Plan,” which promoted new jobs in the economically depressed region. In a proposal inherited from Helms, both Dole and Bowles supported a tobacco buyout plan that put money from the 15 percent tobacco tax towards paying producers more per pound. Dole’s strength proved to be statewide, as she defeated Bowles with 53 percent of the total, garnering votes in both the coastal and the mountainous regions.6 She received the highest percentage for any of the state’s Senate candidates since 1978. Upon her election, Senator Dole’s long political service afforded her some important committee assignments. She served on the Senate Armed Services Committee. Dole also held a seat on the Banking, Housing and Urban Affairs Committee—an important seat to her constituents, since Charlotte, North Carolina, evolved as a financial hub. She also served on the Select Committee on Aging. She served briefly on the Agriculture, Nutrition, and Forestry Committee during the 108th Congress (2003–2005), and in the 110th Congress (2007–2009) she was also assigned to the Small Business and Entrepreneurship Committee. Senator Dole’s legislative agenda reflected her background, particularly her humanitarian work. Nutrition and hunger were specific concerns, as Dole introduced a joint resolution recognizing hunger as a worldwide problem, provided legislation that expands eligibility for subsidized school lunches, and submitted a bill to provide tax benefits to trucking companies transporting food to distribution centers.7 Her attention to her North Carolina constituents was reflected in the successful passage of the tobacco buyout program, accomplishing one of her biggest campaign promises. 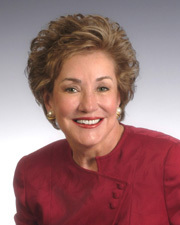 In the 109th Congress (2005–2007), Senator Dole also served as chairwoman of the National Republican Senatorial Committee. In 2008, when Dole stood for re–election to a second term, Kay Hagan—a five–term North Carolina state senator—defeated her 53 to 44 percent, with 3 percent going to a Libertarian candidate.8 Dole’s Senate term ended on January 3, 2009. 1Current Biography, 1983 (New York: H.W. Wilson and Company, 1983): 117. 2Current Biography, 1997 (New York: H.W. Wilson and Company, 1997): 146. 3Quoted in Current Biography, 1983: 119. 6“Election Statistics, 1920 to Present,” http://clerk.house.gov/member_info/electionInfo/index.aspx; John Morrill and Mark Johnson, “Dole Beats Bowles to Take Helms’ Seat in the U.S. Senate,” 6 November 2002, Charlotte Observer: 1. 7These measures were introduced in the 108th Congress. See S. Con. Res. 114, S. 1549, and S. 2494. 8“State Certifies Obama Win, Other Election Results,” 26 November 2008, New & Observer (Charlotte, NC); see also the North Carolina State Board of Elections official results page at http://results.enr.clarityelections.com/NC/7937/14327/en/summary.html (accessed 22 December 2008). Robert J. Dole Institute of Politics. Papers: Career papers, including senatorial service, Commissioner on Federal Trade Commission, U.S. Secretary of Transportation, U.S. Secretary of Labor, president of the American Red Cross. "Elizabeth Dole," in Women in Congress, 1917-2006. Prepared under the direction of the Committee on House Administration by the Office of History & Preservation, U.S. House of Representatives. Washington, D.C.: Government Printing Office, 2006.